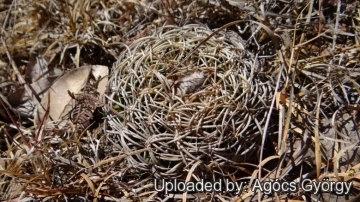 Origin and Habitat: Coryphantha retusa is endemic to Mexico (Oaxaca, Puebla). Altitude range: It occurs at elevation of 1,700 to 2,300 metres above sea level. Habitat: Xerophyllous scrub, open Quercus forest and grasslands on lava soil. 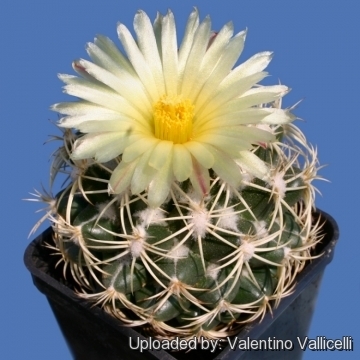 Accompanying species can be Mammillaria carnea, Ferocactus recurvus, Escontria chiotilla and Stenocereus stellatus. Little is known about the population size because it is difficult to distinguish Coryphantha retusa from other species in the genus. Little is known about the threats to this species because of the taxonomic uncertainty. 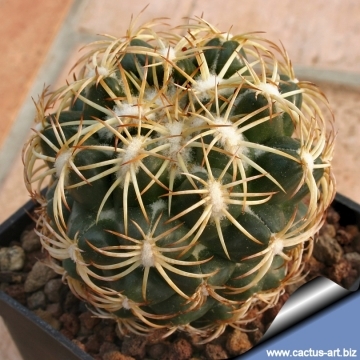 Description: Coryphantha retusa is a small greyish-green cactus thickly covered with tawny wool. Many of the yellowish-brown spines are curved backward. The flowers are deep yellow and borne from the centre of the plant. It flowers profusely. Note: Coryphantha retusa is difficult to distinguish from Coryphantha pycnacantha as well as other species in the genus. The taxonomy of this species needs further research to determine its status. Stem: Generally not offsetting, rarely clumping when old. Depressed spherical 5-10 cm in diameter, 3-8 cm tall, with narrowed base and very woolly apex. Epidermis dark green or greyish-green. Tubercles: Conical, flattened above (retuse), unequally swollen, but variable in width and shape rounded, up to 8 mm tall with abundant wool in the axil and furrow when young, parastichy arrangement: 8-13 (13-21). Areoles: Oblong 4 x 2 mm wide. Radial spines: 6-12 ( to 15) pectinated, 3-4 of them on each side, strong subulate, flattened, curved to the body and slightly downward, radiating the lowest on straight downwards, the 3-5 in the upper part of the areoles thinner needle like. All 14-20 mm long, pale-yellow/white with darker tips later turning grey. Flowers: Bell shaped, central, up to 4 cm cream or yellow, perianth segment lanceolate,oblong, acute, filaments reddish, anthers yellow, stigma and lobes whitish-yellow. Fruits: Olive green, juicy, oblong 30 x 9 mm. 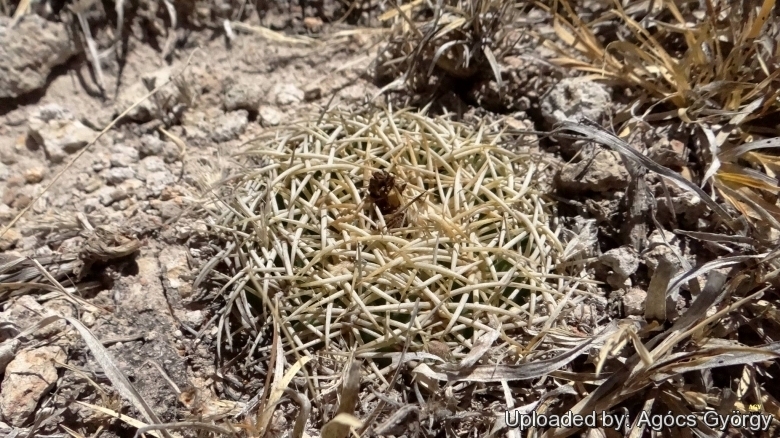 Coryphantha retusa (Pfeiff.) Britton & Rose: has greyish-green stems covered with tawny wool. The yellowish-brown spines are curved backward. Flowers deep yellow borne from the centre. Distribution: Mexico (Oaxaca, Puebla). Coryphantha retusa var. pallidispina Backeb. : has 15 yellowish to pale-grey spines, among them 12 more rigid with thickened bases, the other 3 much thinner. The tubercles are more closely set than the type. 7) Arias, S. 2013. 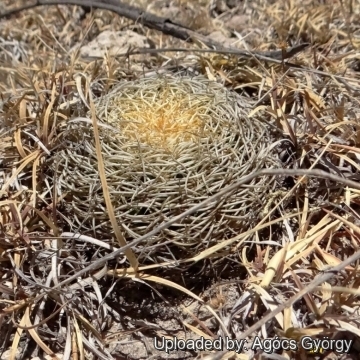 Coryphantha retusa. The IUCN Red List of Threatened Species. Version 2015.1. <www.iucnredlist.org>. Downloaded on 08 June 2015. 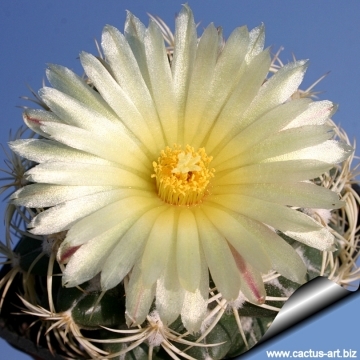 10) Reto F. Dicht, Adrian D. Lüthy “Nomina Cactacearum Conservanda sive Rejicienda Proposita.” In: Cactaceae Systematics Initiatives. 10: 19–22 2000. 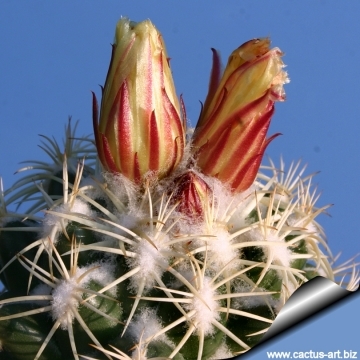 Cultivation and Propagation: In culture Coryphantha retusa is without problems, but it grows slowly. It does best in slight shade, but does well in full sun, too. It is sensitive to over-watering (rot prone), and needs a very porous soil with good drainage. It flowers quite early, but needs about 8-12 years to reach its typical, definite aspect. It tolerates fairly low temperatures as long as it is kept dry (hardy to -5° C or less, for short periods of time).